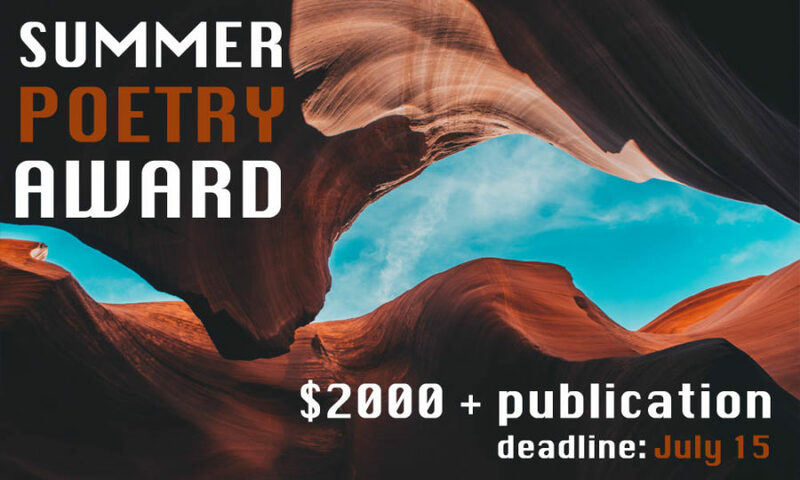 Submissions are currently open for Frontier Poetry’s Summer Poetry Award. A prize of $2,000 and publication on the Frontier Poetry website is given annually for a poem by an emerging poet. The editorial staff will judge. The editors request work “that is blister, that is color, that strikes hot the urge to live and be. We strongly invite poets from all communities.” Using the online submission system , submit up to three poems totaling no more than five pages with a $20 entry fee by July 15. Frontier Poetry is a weekly online publication championing emerging poets; “A place where voices—of all colors, ages, orientations, identities—are made equal by a shared belief in the power of language to confront the dark, the vast, the unexplored.” Frontier sponsors several literary awards throughout the year , including the Frontier Award for New Poets, the Frontier Open, and the Chapbook Contest. Visit the website for more information.